Trading Spaces have been supplying Guard Huts to businesses in the UK since 2010 when we began supplying them to the Olympic Games venues at Stratford in London. 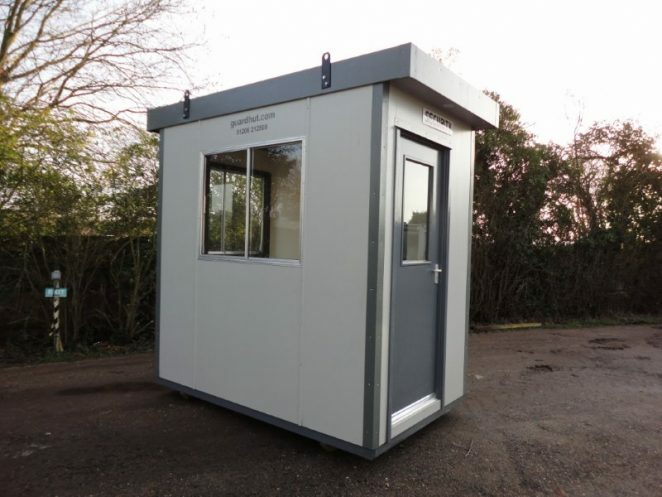 We recognised then that these would be a regular requirement for security guard huts for building and development sites and since then we’ve literally supplied hundreds of them to a variety of UK businesses. These Security Guard Huts can be placed anywhere, and we can deliver at short notice. We can supply Guard huts at the entrance to factories, industrial premises, building/development sites and demolition sites or for car parks serving all manner of businesses or sites. Our Guard Huts all have a quick couple electrical hook up on the outside, internal lighting, heating and a double 13amp socket. The outside of the guard huts is finished in maintenance free plastic coated steel. We can supply and deliver a variety of sizes of guard huts, the most common sizes being 4ft x 4ft, 6ft x 4ft and 8ft x 5ft. We hire guard huts and sell new guard huts but we also occasionally have second-hand security huts for sale and we always have a good selection in stock both for hire and sale. If you require further information on our guard hut range or services, please contact us on 01206 212505 or email enquiries@tradingspaces.co.uk.